Solar panels are the most popular renewable energy system for homeowners because of their fantastic energy-saving and carbon-reducing benefits. Photovoltaic (PV) panels are installed onto the roofs of properties, normally facing south or southwest to receive the most direct sunlight. However, they work perfectly well in overcast conditions too. A free source of electricity for more than 25 years. Solar PV installers often provide lengthy warranties and the technology is proven to last well over 25 years. An escape from the rising prices of gas and electricity. Energy prices have been rising regularly in recent years, so by utilising renewables you’ll be saving even more – up to £220 a year. Added value to your home. With the energy saving potential solar panels provide, the value of your property will increase and potential buyers will see the income earning opportunity as an attractive deal. Low maintenance levels for the efficient running of the system. Solar panels for your home are often referred to as a fit and forget technology, and all you need to do is ensure trees don’t cast them into shadow. Reduced carbon emissions. Carbon is responsible for the increased problems associated with global warming and solar panels help to reduce emissions. 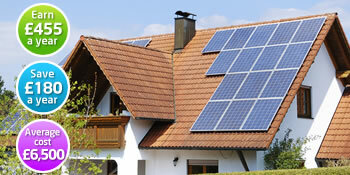 A solar panel installation is one of the best ways to reduce your electricity bills and reduce your carbon footprint. If you’re interested in reducing your bills and helping the environment at the same time, just complete our quick form and we’ll match you with up to four MCS-registered solar professionals. profesional company with big experience,highly recommended!!! Enabled me to decide on a provider without having to trawl through the internet not knowing really what I was looking for. It was wonderful to receive contacts for company's that would contact me and know that they'd be quoting amongst others. I wish I'd known of Quotatis earlier. My knowledge was somewhat lacking in being able to find a company who deals with this type of work and in no time I was in possession of all the information I required., thanks to Quotatis. The below data illustrates the energy performance of homes in Uk. Energy ratings vary from A to G, with A being the most energy-efficient and G being the very least efficient. The Energy Performance Certificate (EPC) rating factors heavily when trying to sell your house, as potential buyers will see how much they're probably going to be spending on their home heating bills. Property improvements including insulation assist to substantially improve a home's EPC rating. There are numerous types of home in the UK and the data underneath illustrates the type of houses within Uk. Over the country the most popular property types are typically semi-detached and terraced housing, however detached homes, flats and bungalows are also available. The data underneath gives an indication for the number of properties in Uk that are central heated and non-central heated. Homes are heated by a number of sources which indicate how pricey annual energy bills will likely be. Examples of central heating include gas, electricity, oil, solid fuel and LPG boilers. Changing exactly how your house is heated can easily see you with cheaper bills. The information below reveals the spread of properties warmed by various fuels. Throughout the United Kingdom the most common hands down are gas heated properties, followed by electricity and then oil. Biomass central heating boilers are also growing in popularity, heated by renewable products such as wooden pellets or agricultural waste.|Properties in Britain are heated up by a number of fuels, which include gas, electricity, oil, solid fuel and LPG boilers. Each fuel has a varying cost associated with it which means you could find yourself with cheaper energy bills by changing the way your home is heated. Even solar thermal panels are being regarded as by many people in order to cut heating bills for the many years to come.